" I have walked it in both a sunny warm winter day and in a windy winter rainy storm. I think I preferred the storm!" This is the CORRECT way to watch waves -- please stay off the rocks! Enormous breakers pound the coast, sometimes sending waves right into the trees. Pack to dress in layers. During the winter, it is most often warm, but can become colder when the skies are clear. Carry a warm layer like a fleece jacket plus a wind/rain shell such as a poncho or rain slicker. A water bottle and a day pack to keep your camera and binoculars dry is a good idea. STURDY shoes not afraid of puddles! Locals favour "gumboots". The gravel trail stays remarkably dry under foot but in a heavy rain you will prefer dry feet. A rain slicker is practical, umbrellas are often toys for the wind! Some resorts lend rain gear. The power of the ocean was dramatically demonstrated last January and again this winter with hurricane force winds. Please respect this deadly force and stay on gravel trails. Respect any closures due to high winds or waves. Watch your footing, rain erosion may create a trip hazard. Waves can be high any time of year, but are most common from November to April. 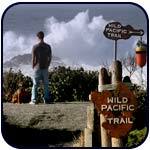 STAY ON THE TRAIL: waves are faster and stronger than any mortal! Bare rocks along the coastline are swept clean of plants by the powerful surf. It is not safe to walk on the rocks or on beaches during storms, even on calm days waves can surprise you. 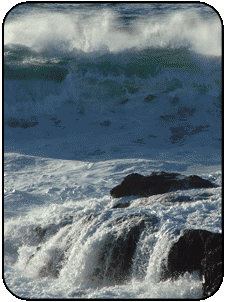 Waves break more dramatically on rocky headlands or reefs. SAFE viewing spots are the Amphitrite Lighthouse and countless coastal over-looks along the trail. The trail will be closed in extreme winds due to risk of trees falling. 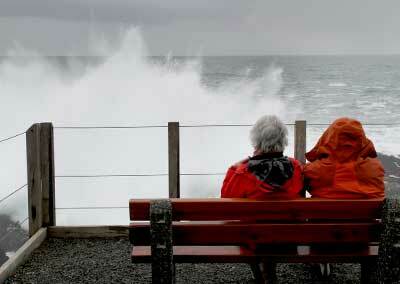 Oceanfront resorts and restaurants also offer cozy viewing no matter how wild the storms may grow. To learn more visit COAST SMART for videos and interactive quizzes. 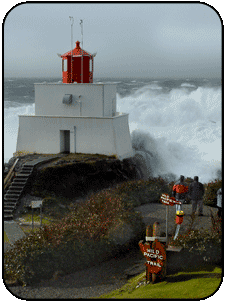 Trip Advisor review: "We visited the lighthouse on a stormy afternoon and were virtually blown off the sidewalk. The most spectacular view of waves crashing onto the shore. We did the short trail 2.5 km was just right for our senior legs." Mild temperatures can be expected year-round. 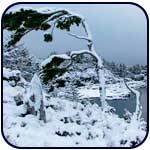 It is very unusual to experience extreme cold or snow on the coastline, but winter snow is common inland, especially on the mountains. Highway 4 crosses a scenic mountain pass that can become slippery during heavy snow. Check this Webcam for current conditions. Good winter tires or chains are required during winter months. Winter weather on the Wild Pacific Trail is usually a cycle of a few days of warm wet weather followed by a few days of sunny cold conditions. The strongest winter storms often arrive from the southwest. Locals refer to this weather as a "Pineapple Express" because these warm winds arrive from Hawaii. The entire trail enjoys a dense rainforest canopy providing a natural umbrella in any weather.